What Are Casein Protein Powders? Who Can Benefit from Casein Protein? How Do I Take Casein Protein? Are There Any Side Effects of Casein Protein? How Do I Pick a Good Casein Protein Powder? In order to help you find a good product we’ve researched & compared the best casein protein supplements on the market right now. Made by Optimum Nutrition, one of the best companies in the industry! 24g casein protein, consisting of micellar casein and calcium caseinate. One serving of Gold Standard 100% Casein contains 24g of high quality casein protein, which is packed with vital amino acids like arginine, alanine, glutamine, isoleucine, leucine, valine, and more. 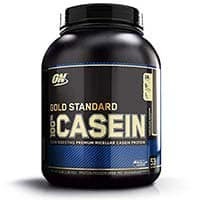 Who makes it: 100% Casein is made by Optimum Nutrition, as part of their Gold Standard product line. Optimum Nutrition is one of the biggest and best companies in the supplement industry. They have many award-winning and best-selling products on the market, and a huge number of loyal fans and customers. In the sports supplement industry, Optimum Nutrition truly sets the Gold Standard for quality, purity, and efficacy. 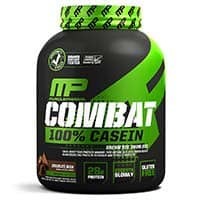 Combat 100% Casein is a simple and effective casein supplement made by MusclePharm. With a large 28g serving of high quality casein protein, plus added digestive enzymes, each serving of this supplement will help get you one step closer to your fitness goals. 28g casein protein, consisting of micellar casein. One serving of MusclePharm Combat 100% Casein will keep a slow and steady stream of important amino acids flowing to your recovering muscles. Digestive enzyme blend, consisting of protease and lactase. Who makes it: Combat 100% Casein is made by MusclePharm, a large fitness supplement manufacturer founded in 2008. Every day, the dedicated team over at MusclePharm works hard to develop cutting-edge formulas for the next generation of fitness supplements. With an already impressive product line and the backing of hundreds of thousands of loyal fans, MusclePharm is here to stay and is widely considered to be one of the best companies in the industry. Naked Casein is a superior-quality product made from only one ingredient: r-GBH-free skim milk from US farms. No colorants, flavorings or sweeteners are added to this product. Naked casein is made using processes that avoid heat, acid or bleach treatment, to give you a slow-release micellar casein that is rich in nutrients. If you’re looking for a superior-quality, slow-release protein source that avoids any added chemicals, then this product is a good choice. 26g of slow-release micellar casein. The slow-release of casein into the body makes it an ideal product to consume before bed. One serving of Naked Casein will provide a sustained flow of high-quality protein to your muscles overnight, helping to boost recovery and maintain lean mass. 4g BCAAs. Branched chain amino acids are the building blocks of protein in the body. This product gives you an extra boost of BCAAs, helping to avoid muscle catabolism overnight. 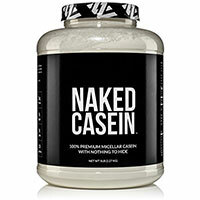 Who makes it: Naked Casein is made by Naked Nutrition. They aim to market products made with only the purest ingredients. Naked Nutrition are transparent about their formulas, so that you can be absolutely sure of what you’re putting in to your body. 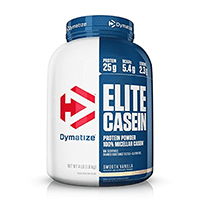 Elite Casein is made by Dymatize Nutrition. and comes with 25g of high quality casein protein per serving, plus an added enzyme blend, Elite Casein has everything you need to keep your muscles fueled with vital amino acids for hours on end. It is priced very affordably, and provides excellent value in each scoop! Who makes it: Elite Casein is made by Dymatize Nutrition, a large scale manufacturer of high quality fitness supplements. Since 1994, Dymatize has employed a team of fitness and health professionals to help create valuable, effective supplements for the next generation of fitness enthusiasts. 25g casein protein, consisting of micellar casein and calcium caseinate. With 25g of casein protein per scoop, one serving of Elite Casein is more than enough to keep your muscles fed overnight, allowing you to wake up recovered and ready to hit the gym again! 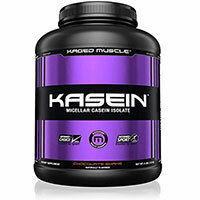 Kaged Muscle Kasein is a cold-processed micellar casein formula that is produced using an innovative microfiltration process. This process protects the natural micellar structure of the protein. Kaged Muscle Kasein provides slow-release protein to your body overnight, creating an anti-catabolic environment and avoiding muscle breakdown. It is available in 2 delicious shake options – Vanilla or Chocolate and contains no artificial colors or flavorings. If you’re looking for something that tastes great, is effective and doesn’t contain and unnecessary additives, then this is the product for you. 24g of slow-release micellar casein and 4.75g BCAAs. One serving of this product provides your body with the protein and amino acids that it needs to create an anti-catabolic environment overnight, avoiding muscle breakdown. Who makes it: Kaged Muscle Kasein is made by Kaged Muscle, a nutritional supplements brand than aims to use the highest-quality ingredients and innovative processing methods to provide superior-quality, affordable products. 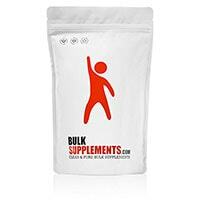 Bulksupplements Casein Protein Powder contains only two ingredients – micellar casein and soy lecithin. It contains 26g of slow-digesting protein per 30g serving, so it an excellent option for athletes looking to build or maintain lean muscle mass. One serving also provides large amounts of calcium and phosphorus – essential minerals to boost bone strength. 26g of protein. One serving of this product provides 26g of slow-digesting protein, to provide your muscles with a sustained source of protein in any situation. Calcium and phosphorous. This product is also a great source of calcium and phosphorus – essential for bone strength. Who makes it: Bulksupplements Casein Protein Powder is made by Bulksupplements, a US company based in Nevada. Bulksupplements facilities are registered with the FDA, and the company tests its products in-house wherever possible. 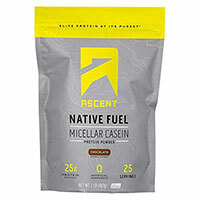 Ascent Native Fuel Micellar Casein is available in 2 great flavors – Chocolate and Vanilla Bean. The ingredients vary slights by flavor, but both are made using high-quality, all-natural ingredients. Each serving contains 25g of protein, along with 5g of BCAAs and 11 essential amino acids, to help avoid muscle catabolism overnight. This product is also a great source of calcium – an essential nutrient for healthy bones. 25g of protein, plus 5g BCAAs. One serving of this product provides all of the slow-release protein and essential amino acids needed to avoid muscle breakdown overnight. One serving of this product also contains nearly 50% of an adult’s RDA of calcium – a nutrient essential for bone health. Who makes it: Ascent Native Fuel Micellar Casein is made by Ascent Food for Athletes, a Colorado-based company that specializes in all-natural protein and pre-workout supplements, made using only ‘real-food’ ingredients. 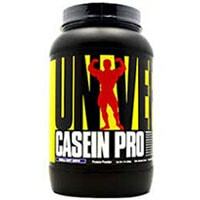 Casein Pro is a premium quality micellar casein protein powder made by Universal Nutrition. Boasting 24g of pure casein protein per serving, Casein Pro makes the perfect bedtime snack for weightlifters. 24g casein protein, consisting of micellar casein. Casein is best known for its ability to be digested slowly over several hours. It’s a favorite of bodybuilders. Who makes it: Casein Pro is made by Universal Nutrition, one of the oldest and most well-respected companies in the supplement industry. Founded in 1977, Universal Nutrition has nearly 40 years of experience developing and manufacturing high-quality sports nutrition supplements to fit a variety of needs. MuscleTech NitroTech Casein Gold Protein Powder provides 24g of high-quality protein per serving. The protein used in this formula can release amino acids into the bloodstream for up to 8 hours, making it a great option to use before bed, or between meals, to avoid muscle breakdown and maintain lean mass. This is a great-tasting product that is designed to dissolve easily, avoiding the gritty texture of some other casein powders. This product is also a great source of calcium. 24g of protein. MuscleTech NitroTech Casein Gold Protein Powder is released into the body for up to 8 hours avoiding muscle catabolism overnight and between meals. One serving of this product contains over 60% of an adult’s RDA of calcium. 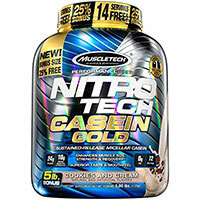 Who makes it: Muscle-Tech Nitro-Tech Casein Gold Protein Powder is made by MuscleTech, America’s Number 1 Best-selling Bodybuilding supplement brand. MuscleTech uses patented formulas and tests its formulas rigorously, to provide highly-effective nutritional supplements. 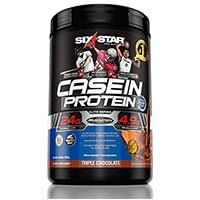 Six Star Pro Nutrition Elite Casein Protein is an effective casein supplement with 24g of high quality casein protein in each serving. Developed by the same company behind MuscleTech, the Six Star Pro product line is designed for the hardest-working athletes out there. Who makes it: This product is made by Six Star Pro Nutrition, which is owned by the guys behind MuscleTech. This product line is designed for professional athletes, weightlifters and anyone else who needs top-notch supplements at a reasonable price. Casein protein is a complex protein found in dairy products. Foods with casein protein include milk, greek yogurt, cheese, and other dairy products. Natural casein protein is also found in trace amounts in some processed meats and seafood, but it’s primarily found in dairy. Of all the casein protein foods, cheese has the highest concentration. Casein is important for bodybuilders because it is absorbed slowly by the body. Unlike whey protein, which digests very quickly, casein takes up to 7 hours to fully digest. Whey protein absorbs/digests at a rate of 8-10g per hour, while casein digests at a rate around 5g per hour. This slow absorption is very useful for a number of reasons. First, it helps keep you feeling full for several hours. For those on restrictive diets, this can be very beneficial in helping to avoid hunger cravings. Second, it keeps your muscles fed with amino acids for several hours, which can help them recover more efficiently, and protect them from damage. Many bodybuilders take casein protein before bed to keep their muscles fueled throughout the night. Casein protein powders are simply pure casein protein extracted from milk and processed down into a fine powder. Generally, the powder is then flavored and sweetened, and may or may not be mixed with other forms of protein (such as whey or soy) to make the finished product. These products will provide a solid dose of natural casein protein in an easy, convenient package. Instead of having to eat large quantities of dairy products, which are high in fat and cholesterol, these casein powders give you a concentrated dose of pure protein. And since you might need more protein than you think, having an easy way to increase your daily intake is important. There are typically two types of these supplements: pure casein protein powders, which contain only casein protein and flavorings, and protein blends, which contain a variety of protein sources, often including casein, whey, soy, egg, etc. proteins. A standard casein protein supplement will typically contain 20+ grams of protein. That’s more than 1/3rd of the daily protein intake needed for the average person. And for those on high-protein diets, it presents an easy way to increase protein intake in an affordable manner. Casein is also a complete protein with a good amino acid profile. Casein is a slow-digesting protein, which takes your body a lot longer to digest than whey protein and other protein sources. For this reason, casein is considered “anti-catabolic”. When taken after exercise, it helps to feed your cells with a steady stream of amino acids. This can help your cells synthesize protein in times where you would normally be breaking down muscles to keep cells fed, such as when you haven’t eaten in a while. One in-depth study looked at the absorption rates of whey and casein protein. It found that whey protein caused an initial spike in amino acid levels, followed by a short-lived ongoing stream of aminos. Casein on the other hand, caused a smaller initial spike, followed by a long and steady flow of amino acids. Another study found that participants given casein protein reduced the total amount of protein burned for fuel over a 7-hour period, resulting in an improved net protein balance (a key factor for muscle growth). Casein is very effective for stimulating muscle growth, when combined with strength training. It contains all the essential amino acids, including a high concentration of leucine – which is key for muscle protein synthesis. Leucine is considered a trigger for the anabolic muscle-building process. If you have a low to moderate dietary intake of protein, taking casein protein can boost muscle growth simply by increasing your protein intake. Additionally, casein helps to protect muscle mass long-term, by reducing protein breakdown at night and during extended periods without food. It’s particularly effective when taken at night, as it helps keep your muscles fed during rest. One study found that participants given a casein protein shake before bed helped to increase muscle mass and strength gains following exercise. Casein may have some other benefits, although these are less rigorously studied. Some studies suggest that casein may have immune and antibacterial benefits. Another found that it may help to lower triglyceride levels. Several studies have found some of the peptides in casein protein may have antioxidant properties. Lastly, taking casein protein may be beneficial for weight loss. More research is needed on these potential benefits. Overall, casein protein appears to be beneficial for all the applications listed above. It has been studied extensively, and most manufacturer claims are backed up by real science. With that said, many of these same benefits can be obtained through dietary sources of high-quality protein. Bodybuilders – Bodybuilders, weightlifters and other strength athletes will experience many benefits of casein protein. Anyone who lifts weights on a regular basis needs quite a bit of protein in their daily diet – so much so that it can become a challenge to meet that requirement with food alone. Casein powders are an affordable and easy way to increase your daily protein intake. Casein is particularly useful for use before bed, as it keeps your muscles fueled throughout the night. As a weightlifter, you want to remain anabolic at all times, and avoid entering a catabolic state at all costs. With a quick casein protein shake before bed, you can keep your muscles happy all night long with a steady stream of amino acids. Athletes – Athletes of all types can benefit from adding a casein supplement to their diets. Whenever you use your body in a strenuous way – whether that’s with running, sports, weightlifting, or something else – you damage your muscles. With proper fuel, your muscles will recover and grow larger – and casein protein is the perfect fuel for muscle growth! Casein protein is the best type of protein powder for athletes wanting to recover faster and more efficiently. Vegetarians – Vegetarians, and others on restrictive diets can benefit from casein protein. As someone who doesn’t eat meat and/or dairy products, it can be difficult to meet daily protein intake needs. Adding a casein protein can help. Keep in mind that, since it’s derived from milk, casein is not technically vegan – although it is vegetarian. If you’re looking for a true vegan protein powder, look for a good vegetable protein and/or soy protein blend. Casein protein is best used for muscle recovery so, it’s good to take after workouts, and before bed to help fuel your muscles at night. Most experts recommend that you take whey protein immediately following your workouts, because whey absorbs faster. This is beneficial because your body needs to absorb nutrients quickly following a workout. Casein, on the other hand, takes several hours to digest which makes it a better choice for periods of time when you won’t be eating. Many weightlifters like to use casein protein before bed, because of the unique casein benefits and slow-digesting properties. This is really the best way to use these supplements. Having a quick casein shake before bed will help keep a steady stream of amino acids flowing to your muscles for up to 7 hours. To sum up, casein protein is best used in between meals and before bed. Lastly, we recommend using a BlenderBottle to mix your casein shakes – it’s much easier than using a clunky blender! Some people experience an upset stomach and/or gassiness when taking casein protein powders. If you find this happens to you, try having your casein shake after a meal and not on an empty stomach. A small percentage of people are allergic to casein protein and/or the other ingredients used in these supplements. Allergies can be minor to severe, resulting in anything from upset stomach to vomiting to rashes. If you have an allergic reaction to ANY supplement, stop taking it immediately. There are more possible side effects for consuming too much protein in general, but that doesn’t apply specifically to casein protein. In general, there are very few casein protein dangers or side effects to be worried about. To avoid any potential side effects, we recommend that you always follow the dosage instructions on the product packaging. Do not take more than the recommended amount, unless you run it by your doctor first. This applies to ANY supplement you take. Quality of Ingredients – what type of casein protein is used? Micellar casein, casein hydrolysate, calcium caseinate, etc? What type of sweeteners are used? Are there any unnecessary ingredients? The casein product you choose should generally be a simple, clean formulas with a solid dose of protein and not much else. Amount of Protein – how much protein is in each serving? The majority of our top recommendations include around 20-30g in each serving, so look for that ballpark. Value for Money – how much does the product cost per serving? Be sure to calculate on the actual per serving cost (or per gram of protein cost), rather than just comparing the price of two different packages. While you don’t necessarily want cheap casein protein, you don’t want to spend more than necessary. Taste/Texture – how does the product taste? Does it mix easily? It can be difficult to tell, so we recommend reading user reviews to get a feel for how people like the taste. Also make sure to get a flavor that you actually like.